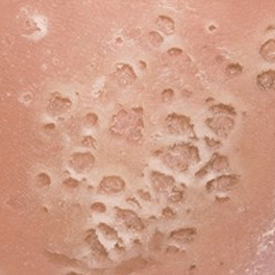 Verruca is a type of wart that usually find at the bottom of the feet. Warts are infectious (human papilloma) but not moles. 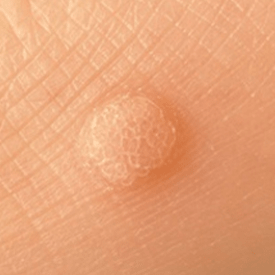 Most people will have warts at some point and are small lumps that develop on the skin. They are normally harmless and usually go away on their own eventually, however, this can take many months or years. We have a wealth of expertise in treating warts and verruca and approach each case with sensitivity and care. Using the latest laser technology, we effectively treat warts and verruca with amazing results. Palmar and plantar warts– grow on palms (palmar) and soles of feet (plantar). Mosaic warts– multiple palmar or plantar warts that coalesce on hands or feet. How does the Dual Yellow work? The dual yellow laser treatment uses a copper halide tube technology, which provides the characteristic healing light. The dual yellow laser treatment differs from other laser treatments by producing two wavelengths of light rather than one – both green and yellow. Each wavelength targets a different skin problem. The hemoglobin pigment in the red blood cells responds very well to the yellow wavelength of light. The pigment absorbs it much better than the melanin in the skin does, making the yellow wavelength excellent for treating blood vessels. The green wavelength used in the dual yellow laser treatment targets the melanin– the pigment which gives colour to the skin. This makes the green beam much more effective for treating pigmented legions. When combined, the two wavelengths create a powerful beam for ablating or vaporising lesions. The combination of the two wavelengths of light is also excellent for the treatment of acne. For most Warts/Verruca’s, only one treatment is necessary. Make sure the area is clean and avoid wearing any shoe or clothes that might still have infection.